“Well, some amazing changes that are fantastically big and fantastically fast are coming our way,” says noted futurist Alvin Toffler in the much-anticipated movie, The Singularity Is Near: a true story about the future, available today. 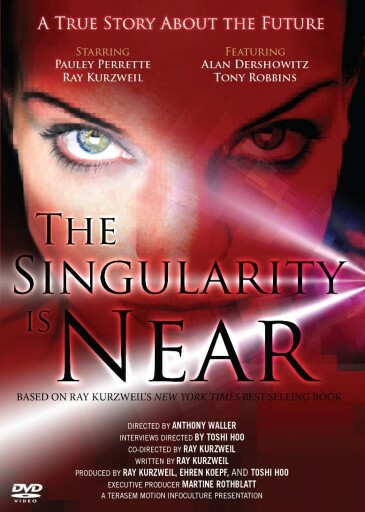 The Singularity Is Near stars Ramona, played by NCIS star Pauley Perrette, a superintelligent avatar (artificial-intelligence- based, human-like virtual person) created by AI wizard Ray Kurzweil (played by himself). Ramona desperately wants to be accepted legally as a human, but faces immediate shutdown by the authorities. So she turns to (who else?) famous civil liberties lawyer Alan Dershowitz (played by himself) and seeks coaching by Tony Robbins (also played by himself) to discover what it means to be human. These dramatic scenes punctuate an investigation of our amazing future by Kurzweil in dialogue with 19 “big thinkers,” who explore the impacts of the rapidly accelerating amazing technologies ahead, enriched with animations and graphics. The movie is available exclusively through store.singularity.com via downloading, DVD, or deluxe box set (including the feature film and more than three hours of bonus material, behind-the-scenes footage, and extended interviews). A Terasem Motion Infoculture presentation in association with KurzweilAI.net, based on Ray Kurzweil’s New York Times best-selling book The Singularity Is Near.